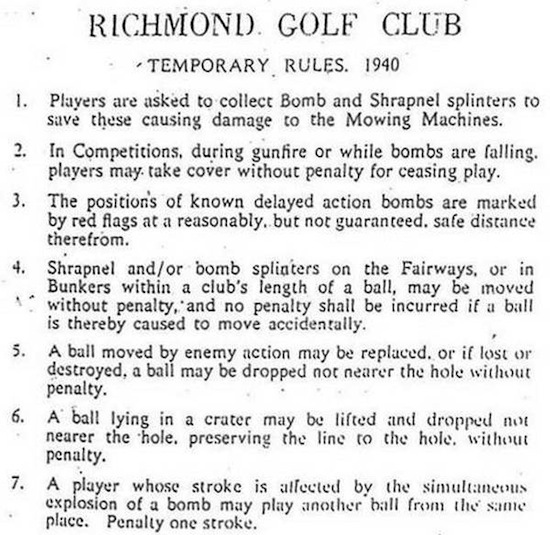 A friend recently sent me a set of Temporary Rules apparently instituted by the Richmond Golf Club just outside London England in 1940. These rules were put in placed to deal with member safety during the German bombing raids and the resulting havoc they wreaked on the golf course. My naturally inquisitive nature led me to see if these rules were authentic or if they were just another ‘urban myth’. 2. the Brits were sticklers for rules, I mean, one stroke penalty if your stroke is affected by the simultaneous explosion of a bomb. Really? Many thanks for your enquiry re the ‘wartime rules’ associated with this Club. They are indeed genuine and are displayed in our Member’s Bar for all to see, apparently Lord Haw Haw himself referred to the ‘Englishmen’ and Rules personally in one of his infamous broadcasts.